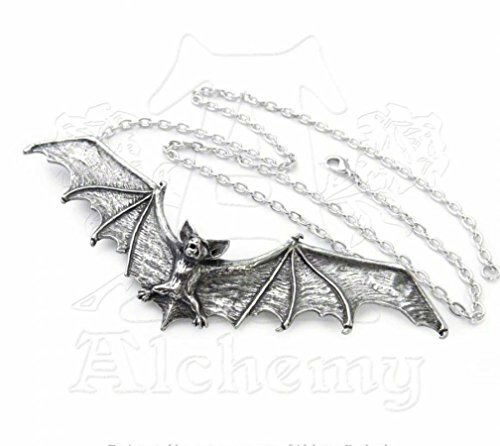 Alchemy of England Gothic Vampire Bat Necklace The quintessential symbol of gothic darkness, a true creature of the night in full flight. A gothic best -seller with timeless appeal. 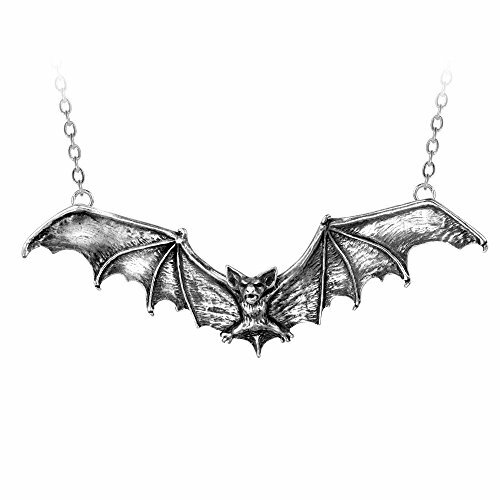 The classic swooping bat, pewter necklace with spreadeagled wings. Features: -bat measures appr. 5" wide -Fine English Pewter, Antiqued Finish -25" split chain. Words & pictures cannot accurately convey the extravagant artistry of the jewellery pieces by Alchemy of England denoting the futuristic, victorian & scientific fictional culture of the steampunk movement. If you have any questions about this product by Alchemy Gothic, contact us by completing and submitting the form below. If you are looking for a specif part number, please include it with your message.